A Cornish is a particular breed of chicken. Traditional Cornish hens are female Cornish chickens. The Cornish hens available in grocery stores are actually a hybridized breed of bird developed especially for commercial production. Cornish chickens are a large English breed with white, black or red feathers. They are a heritage breed, meaning they've been bred for many years in a particular location with traits conducive to thriving in that environment. They are now raised by backyard enthusiasts and small farms. Cornish chickens are poor egg-layers and are bred for meat. A Cornish hen is female and can be any size. Because Cornish chickens take a long time to mature, commercial chicken farmers raise rock Cornish hens, which are a cross between Plymouth Rock chickens and Cornish chickens. They are sold in grocery stores as "Cornish hens." They have white feathers, grow very fast and require less feed to reach maturity than most breeds. They are prone to health problems such as heart attacks and skeletal deformities due to their rapid growth. 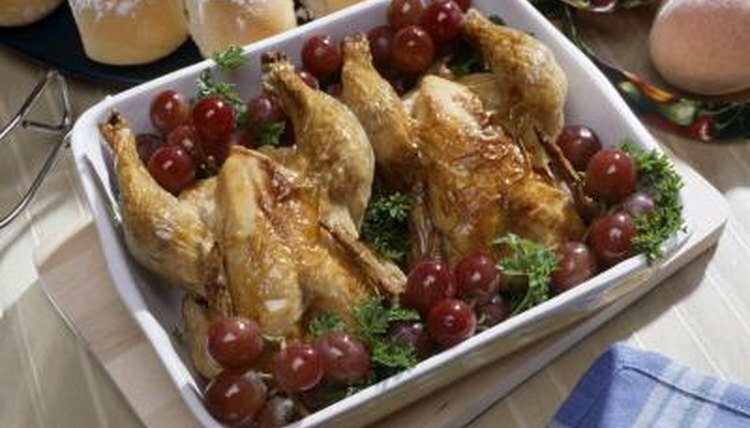 Grocery-store Cornish hens can be male or female and weigh 2 to 5 pounds. True Cornish game hens are young female Cornish chickens weighing about 2 pounds. Grocery-store Cornish game hens are rock Cornish cross hens of the same size. They are butchered at 4 to 5 weeks of age. A poussin, or "spring chicken," is a 3- or 4-week-old chicken weighing 16 to 24 ounces. They are very tender and popular in Europe. A capon is a large castrated rooster that weighs 6 to 10 pounds, butchered at about 6 months of age. They have large breasts and more fat than most chickens, making them meaty and flavorful.